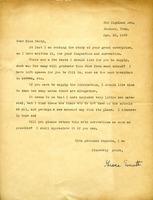 Elizabeth writes to Martha asking for complete information regarding the school for girls, as she would like to know more after Martha's talk about the schools. 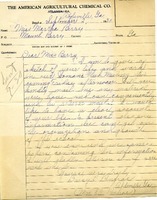 Daisy L. Renfrae writes to Miss Berry asking for any literature that she could send back by return mail because she wants to give an accurate representation of Miss Berry's life and work for her presentation at the Woman's Club Meeting. 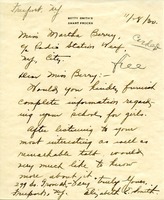 information, meeting, The American Agricultural Chemical Co.
Martha Berry thanks Mr. Allicott for his letter, and says she is sending him literature about the schools. 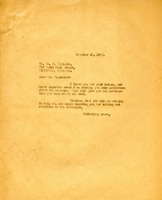 She trusts that he will be willing to help. 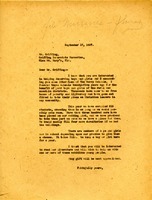 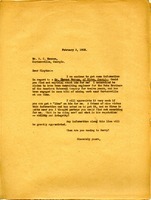 Martha writes to Mr. Griffing with information about the schools and a bit of history knowing that he is interested in helping the boys and girls.